Franco Zeffirelli, the Italian film, stage and opera director, has said Pope Benedict XVI needs a makeover of his "cold" image and "showy" clothes. Zeffirelli told La Stampa newspaper that the Pope communicated in a cold way that was little suited to what was happening around him. These are not times for high tailoring in papal vestments, he said. 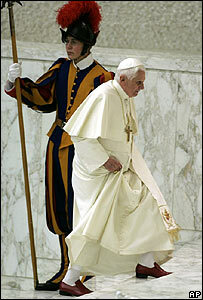 He contrasted the relaxed attitude of the late Pope John Paul II to his official attire with that of Benedict. Lacking his predecessor's charisma, Pope Benedict has taken to wearing some eye-stopping outfits in public, such as a red velvet cape trimmed with ermine, not worn in public since the death of John XXIII in 1963. When he donned a fur-trimmed red cap, some people mistook it for a Santa Claus hat. Zeffirelli, a Roman Catholic, was employed several times by the Vatican during John Paul II's reign as a designer for the staging of major papal ceremonies. He told La Stampa he would relish being Pope Benedict's image consultant. "If they gave me an official supervisory role, I would dedicate myself to it full time," Zeffirelli said. "I know [Joseph] Ratzinger personally," he added, using the German-born pope's name before he became pontiff. "He is very attentive to the importance of how the sacred is represented." So far there has been no reaction to Zeffirelli's offer from the Vatican. ...Don't forget that the Pope is from Bavaria, a region which wears their traditional clothes more than anywhere else in Europe, as far as I know. The area makes a big show of public Christianity - crucifixes everywhere, religious paintings, parades etc. It is sometimes difficult for foreigners to integrate in this tightly bound, very religious society. Religious fundamentalists have a way of forgetting to be kind to others. The Pope is a very intelligent man, I hope he will show himself to be as Christian as he is intellectually rigorous. I definately dont think he needs a makeover by anyone. What he wears is part of a long tradition, and i think it gives him distinction and it is honestly quite cool. As for the comment on materialism. please get your facts right. First of all, the pope lives in an apartment in the building called "apostolic palace." The monks do not live in lavish palaces, i have seen the apartments of some famous cardinals, and they are no bigger than my grandmother's two bedroom apartment. the property owned by the Vatican is actually rented out at low prices for less fortunate people. And before judging him for not doing what Jesus instructed, you should read what he really says and learn the facts. I dont see anyone going crazy about the luxurious lifestyles of modern charity gurus like Brangelina, Oprah or Madonna. Benedict is modest in comparison. As for Zefirelli, thanks for the offer, but please stick to your area of expertise: directing cheasy films and staging bizzarre opera sets. If the pope can't dress differently from most people, who can? These calls for him to dress down aren't populist or democratic, but plain conformity and blandness of taste, which are more authoritarian than the Pope's current wardrobe. Mother Teresa didn't need a Franco Zefferelli to carry Christ's message of love to the world. Truly I tell you not Solomon in all his finest costume nor the Pope in his Zefferellian makeovers would come close to matching the image of that disciple of our times. Money would be better spent reconsidering the content rather than the clothing of the Catholic faith. Anyway, with all of his ridiculous and fluffy pompousness, Zeffirelli is not quite the man to do it. His teacher, rival and superior Lucchino Visconti would have pulled it off better. But he is dead and anyway was a Communist. Next idea, please! I think that Zeffirelli is making a pious offer and given his expertise, it should be taken seriously. On the other hand, I wish that I could afford Prada! Jesus Christ & his Apostles/disciples wore simple & unassuming clothing. Jesus Christ challenged his followers:'Go into all the world & preach the gospel.' I do not see any mention in my Bible about poncing around in fancy gear or living in marble palaces!Or for that matter,triping around behind a Swiss body guard in antique style clothing. Dave T.Chew, West Bank. British Columbia. Canada. Life is not a movie, Mr Zeffirelli. You want to stage-manage a production of your very own with a celluloid, fake pope at its centre. The Pope's "job" is to please God, not the media. With all due respect for the incandescent genius of Zeffirelli, it really is not necessary to package every single person, story, item & institution in media-friendly glitz. The Church is popular with those to whom it matters: it is not necessary, nor indeed desirable, to court the approval of those for whom the Church is an irrelevant institution. And ultimately, the oft-overlooked rule in fashion is: please yourself! If a person is not inappropriately dressed, and likes how she or he looks, they are entitled to dress in whichever way they please, that they can afford. Does Mr Zeffirelli allow the Pope to influence how he should dress, or live? I think what Zeffirelli is voicing is a contemporary mindset that seeks to dilute the cultural, the traditional and the symbolic to a lowest common denominator. This is ridiculous, without our roots we are uncertain ground. The Pope wears the traditional attire of his office, most often a simple white cassock, his attire never changes with fads. I think the simplicity the Pope demonstrates is remarkable, and his link with tradition is important for a Catholic world in danger of throwing the baby out with the bath-water. His 'image' is that of the Pope, it is neither a statement on fashion ethics nor the loud manifestations of what is in actual fact a humble and spiritual pastoral personality. John Paul II was the first pontiff to wear designer robes, for instance (Nino Lo Bello, "The Incredible Book of Vatican Facts and Papal Curiousities". Liguori Publications, Vatican City. 1998.). That he is choosing articles that seem to emphasize a high station should not be entirely surprising when you consider that heads of state, which he is, are expected to wear thousand dollar suits or, the designer dresses when making formal public appearances. Mr. Zeffirelli's observations include that His Holiness takes care to how the sacred is represented. Part of the "image" that Benedict can convey in his dress is that he is the ultimate authority on doctrine for Catholics, he is the worldwide head of over 700 million people spiritually, and so uses some of the trappings to lean on a soon to be two-thousand year apostolic legacy . He is remarkably in touch with the times, but is willing to make a stand even if it is unpopular. What is amazing is, he seems to get more people showing up to listen; perhaps the red cape does emphasize the throne but it catches one's eye and attention. It is not all a power play, though. For those who think that he stands for something medieval and anachronistic, I think the sunglasses should tell you what in year he lives and makes it just a little easier to relate to him. Jesus was a humble man who wore ordinary clothes and walked amongst humble people. The pope should take note. His showy lifestyle sends out entirely the wrong message. Ghandi was spot on when he said "You Christians are so unlike your Christ". Take a leaf or two from Ghandi's book and learn to be humble. He needs a new mind, a 21st century mind, not a refashioning of his purple and gold rags. Whatever he wears, he is still from the dark ages. The Pope is a hard working man who has dedicated himself to improving relationships with Jewish communities and China. He treats his position and responsibilities with the reverence they require and command. Who cares about a cap? The Pope's obsession and delight with fancy clothes, shoes, hats sunglasses and skirts defy his attacks on people for consumerism and relativism. He lives in an enormous palace as do the monks and nuns which sparsely inhabit some of the most valuable property in Rome. They own 25 percent of historic Rome. Yes, he needs an image change. He should spend less money on frills and fancy wear and do what Jesus instructed. The Pope's decision to wear more traditional attire is part of a wider campaign of restoration. The moto proprio allowing wider use of the tridentine rite and the removal of the former papal liturgist are also examples. Zeffirelli is producing the defeated liberal argument that the church should marry herself to the times in order to be relevant to a world that hates it. I pray His Holiness does not listen to this fool. Is it OK for Jon Bristol to call Zeffirelli a fool? I guess if we call those that worship a faith that cannot be proven foolish that should be OK too. "I pray His Holiness does not listen to this fool. ". Spoken like a true Christian, Jon. Or a true Catholic, at any rate.